At the turn of the century visitors flocked to the area. They drank mineral water from local springs to cure their ills and they took riverboat excursions to the cliffs. Things have changed since then. Mineral water now comes in bottles and isn"t likely to cure anything at all, and riverboats have given way to more modern modes of transportation. The cliffs, however, remain virtually unaltered, standing as a journal of the geological and biological history of the land. See this spectacular formation, now protected within the boundaries of Cliffs of the Neuse State Park. Recreation activities in the park center on an 11-acre man-made lake where a sandy beach, diving platform, roped-off perimeter and bathhouse provide all of the facilities needed for a refreshing swim. For those who prefer to stay on top of the water, rowboats are available for rent. Private boats are not permitted. For the hungry, there"s also a refreshment stand. Boating and swimming are available Memorial Day through Labor Day from 10 a.m. to 5:45 p.m. for a fee. Swimming is permitted only when lifeguards are on duty. Family Camping: Set up tent or trailer on one of thirty-five sites, each with its own picnic table and grill. The family campground at Cliffs of the Neuse is located in a wooded area near the park office. There are no water or electrical hookups, but a dump station is provided. Water is available at several locations in the camping area and a wash house with hot showers and electricity is centrally located. Occupancy is limited to one family or six people per site. The family campground is open March 15 through November 30. Park gates are locked at the posted closing hours, and campers may not leave the park after closing or before 8 a.m., except in a medical emergency. Group Camping: A portion of the park has been set aside as a primitive camping area for organized groups. Each site has picnic tables, a fire pit and a grill. Drinking water and pit privies are located nearby. The group campsite is reached by hiking the Spanish Moss Trail. Reservations are required for use of the area. Group camping is available year round. Rangers hold regularly scheduled educational and interpretive programs about Cliffs of the Neuse State Park. To arrange a special exploration of Cliffs of the Neuse State Park for your group or class, contact the park office. Educational materials about Cliffs of the Neuse State Park have been developed for grades 6-8 and are correlated to North Carolina"s competency-based curriculum in science, social studies, mathematics and English/language arts. The Cliffs of the Neuse program introduces students to basic geologic concepts, including geologic history, fossils and prehistoric life, and erosion. Accompanying the program is a teacher"s booklet and workshop, free of charge to educators. The banks of the Neuse River provide scenic spots to wet your line. The river and its tributaries are home to bluegill, largemouth bass and several species of catfish. In the spring, white and hickory shad migrate up the river. A state fishing license is required and all regulations of the Wildlife Resources Commission are enforced. Follow the cliffs" edge for lovely views of the river below. A path bordered by a rail fence leads along the riverbank. Oaks, dogwoods and other trees line the path, often cloaking views of the river with a veil of Spanish moss. 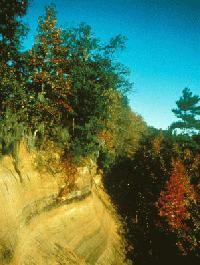 An observation area at the lower end of the bluff provides visitors with a view of the cliff face. Though the cliffs formed over millions of years, irresponsible actions on the part of man could destroy them in no time. To preserve this beautiful formation, climbing on the cliffs is not permitted. Follow park trails to creeks that were once used to make moonshine and cornmeal. Mill Creek was the home of a gristmill that processed grain while federally-operated whiskey stills were located along Still Creek. Today, the area where these creeks empty into the Neuse River serves as a place to fish and enjoy nature. Four hiking trails are accessible from the parking lot at the museum. Each is less than a mile in length and offers a closer look into the heart of Cliffs of the Neuse State Park. An interpretive museum is located at the northern end of the cliffs where creative dioramas and audiovisuals depict the geology and natural history of the area. Adjacent to the museum is an outdoor amphitheater where interpretive programs are often held. The shade of huge pine trees offers just the place for outdoor dining. Located near the lake, the picnic area has 60 picnic tables served by 8 grills. Drinking water and restrooms are located nearby. The park"s picnic shelter is perfect for large gatherings. Twelve tables and two fireplaces are housed in a covered brick shelter. To be certain that the shelter is available, reservations are advised. Use of the shelter is free of charge and on a first-come, first-served basis, unless reservations are requested. Camping in non-electric sites: $15 per day, per site; $10 per day for senior citizens ages 62 and older. A picnic table and grill are located at each campsite. Water, restrooms and shower facilities are located nearby. A dump station for RVs is provided free of charge to registered campers. The family campground is open March 15 through November 30. Group campsites: $1 per person with a $9 minimum. Picnic tables, fire pits, grills and waterless toilets are nearby. Campsites are open year round. Reservations are required. Picnic shelter reservations: $85 per day. Includes 12 tables and two fireplaces. Shelter is available free of charge on a first-come, first-served basis when they are not reserved. Restrooms nearby. Boat rental: $5 for the first hour and $3 each additional hour Memorial Day through Labor Day from 10 a.m. to 5:45 p.m. Boating is permitted only when lifeguards are on duty. Swimming: $4 per adult, $3 ages 3 through 12, Memorial Day through Labor Day from 10 a.m. to 5:45 p.m. Swimming is permitted only when lifeguards are on duty.